When I'm carrying concealed while doing outdoor photography, my first choice is a Colt Officer's Model, so I was interested to see that Dan Wesson recently came out with the Dan Wesson Concealed Carry Officer (CCO) Bobtail--a 1911 with a Commander length barrel with an Officer's Model frame. For those who like the balance of a longer barrel but who like the conceability of a smaller frame--and don't mind one less round in the mag--this might be the piece for you. While it may seem odd to have a longer barrel/shorter frame gun, handling it shows its position in the scheme of things rather quickly. You get a longer sighting radius and less weight, noise and muzzle blast that's farther away from you. Thanks to the weight and shorter, bobtailed grip, it is easier to carry this gun concealed. I like this configuration because when I'm carrying a large camera backpack, the shorter grip and the bobtailed mainspring housing means it won't rub against my body or hinder my movements. To lower the weight of the gun, both the frame and mainspring housing are made from anodized aluminum, and to control the gun during recoil both the front and rear of the grip frame feature a new chain link pattern. Additionally, the frame is undercut beneath the trigger guard, which helps to compensate for the shorter grip length. Dan Wesson uses parent company CZ-USA's proprietary black ceramic Duty coating, which it also uses on the larger Valor pistol. (This coating has been changed for the 2010 model year. 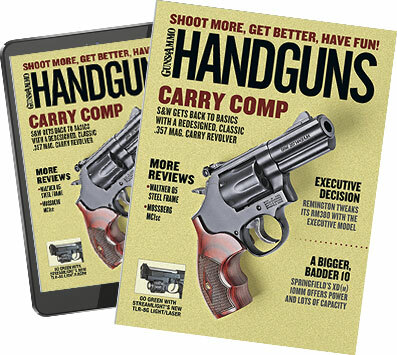 See New Handguns 2010 elsewhere in this issue.--Ed.) I like this coating as it has the benefits of a matte patina without the debris-catching bead-blasted finish so common today. The gun is evenly polished, especially around the trigger guard and the top of the slide. Slide serrations were cut sharply without any burrs, and all the sides on the gun were pancake flat without any dishing from the final finishing station. The front sight blade features a white target ring surrounding a tritium vial, and the rear sight has two white tritium dots for fast target acquisition in low light. The rear sight is low profile, melted somewhat into the slide and is drift-adjustable for windage. The rear notch is well-defined and, when lined up with the front sight, allows just enough light on each side of the blade for perfect sight alignment. The CCO Bobtail sports a lightweight hammer and tritium night sights. The grasping grooves on the slide were perfectly executed. Operator controls--slide release, safety and magazine release--are standard 1911. To keep the gun as slim in profile as possible, there is no safety lever on the right side of the gun. I found this safety lever has a very distinctive detent from safe to fire, assuring positive feedback on the condition of the gun. The mainspring housing is flat with, as the name implies, a very slightly bobtailed frame, and there's a memory groove on the beavertail safety for added comfort and improved grip. The CCO Bobtail features a medium-length trigger shoe that makes up the difference between the shorter mainspring housing and the space to the trigger itself. Trigger pull on this gun averaged 3½ pounds of pull with just a hint of slack. The hammer is of the competition breed--lightweight and Commander styled. Notes: Accuracy results are the averages of three five-shot groups at 25 yards off a braced rest. Velocities are averages of 15 shots measured on an Oehler Model 35P chronograph set 10 feet from the muzzle. Temperature was 65 degrees. Abbreviations: FMJ, full metal jacket; JHP, jacketed hollowpoint; MC, metal case. The CCO Bobtail's trigger employs a medium-length shoe for a better fit in the hand, and the frame is undercut behind the trigger guard. The match barrel is 4¼ inches long and fitted perfectly to the gun. The barrel mates to a well-polished barrel bushing for that extra measure of accuracy. The feed ramp is polished mirror smooth, and the ejection port has been relieved for 100 percent reliability. The gun comes with a pair of handsome Shadow grips, which are cocobolo and laser-etched in a very distinctive, stippled pattern. Two magazines are supplied, and the CCO Bobtail carries a limited five-year warranty. At the range, the gun was a joy to use. Even with the shorter grip, there was more than enough gun to hold on with larger hands. The pistol recoiled pleasantly, and with lighter bullets such as Winchester 185-grain FMJ, the gun behaved much like a 9mm. The cocobolo Shadow grips have a distinctive laser-etched pattern, and the frontstrap features a chain-link texture for enhanced control. In 1968, Dan Wesson started his company in an old schoolhouse in Monson, Massachusetts. He was proud of his accomplishments in the revolver field, and I don't believe he ever imagined his name on 1911s. But if he were alive to witness the progression of the Dan Wesson pistols, he would have been as pleased with how they came out as I have been.